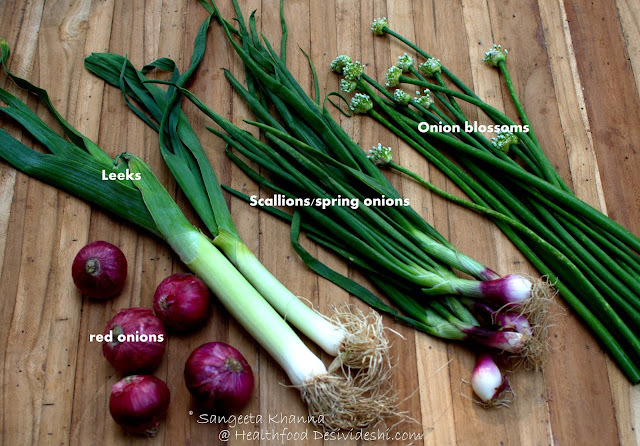 Spring onions or Scallions and Leeks are nutritious foods and one must get them as much as possible when they are in season. We have a shorter season of onion scapes or onion blossoms here in the North India, so we make use of the opportunity quickly when we spot them around. The greens of the onion are more fiber rich, more antioxidant and flavonoid rich and pack more flavors too. These 'plant onions' have the goodness of both onions and greens. The different varieties provide even more diversity in flavors as we combine them with different kinds of foods. The Thiosulfinate (allicin) found in onions (garlic too) and green onions is known to decrease blood vessel stiffness, hence it helps in high blood pressure conditions. Rich in Vitamin C, A, K and B complex, the greens of onions are a delight to have. Read more here. 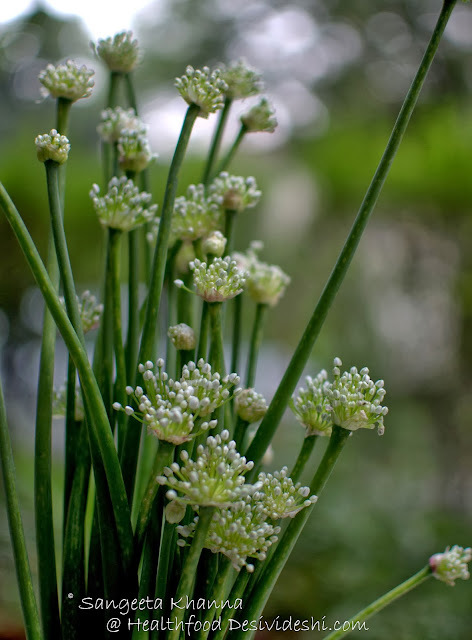 I get a bunch of onion blossoms or onion scapes whenever I spot them and keep them all in a vase. The tender buds are used first in egg scrambles, omelets, stir fries and even in soups but when the buds bloom to beautiful flowers the stalk becomes harder to be used. That is the time to use only the blossoms for salads or stir fries and the harder stalk goes to vegetable stocks. This really quick stir fry with onion blossoms and button mushrooms will be a nice side dish, a topping for bruchetta, a stuffing for sandwiches and even a pizza topping with loads of cheese if you wish. I chose to toss it with boiled pearl barley to make a nice salad meal for myself. No peeling involved, so half the work take care of. Just rinse the vegetables and chop them roughly or neatly as you wish. The cooking takes just 5-8 minutes if you are cooking for two. Mushrooms are my favorite and button mushrooms we get all the time, easily. I would use a mix of different types of mushrooms if available, but this is the everyday kinda stir fry so you can do it simpler too. 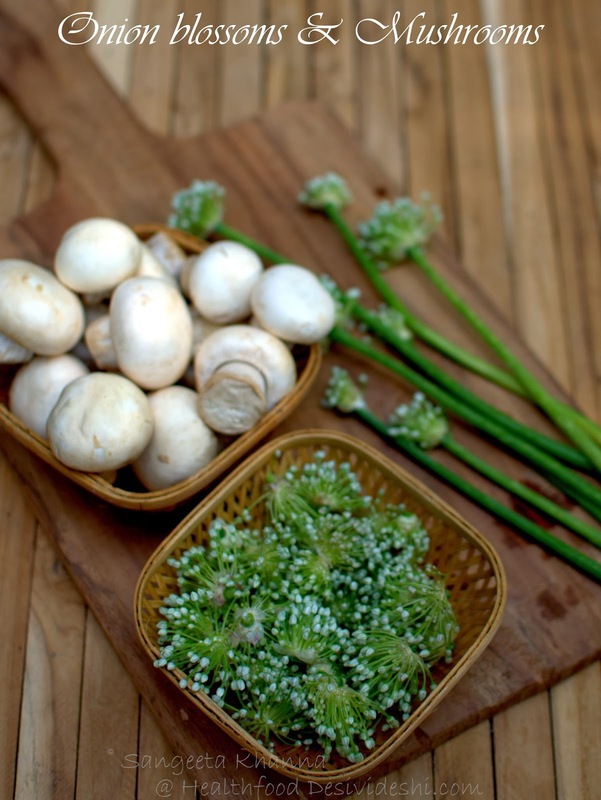 Or bring textural variety by adding Enoki, black fungus and may be some Ear lobe mushrooms when you are making it for guests. Heat the butter and olive oil both in a pan together and tip in the chopped garlic. 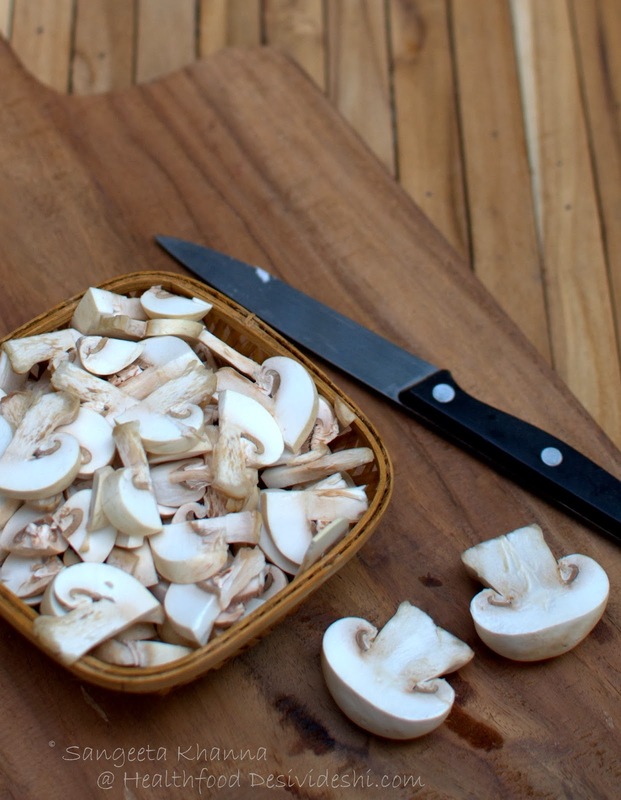 Fry for a couple of seconds and toss in the chopped mushrooms and chopped onion shoots along with salt to taste. 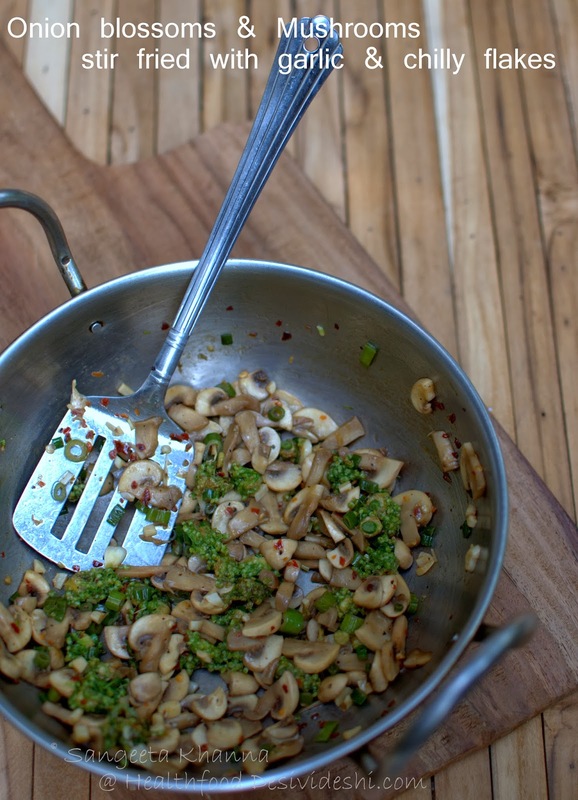 Stir fry till the mushrooms sweat. Add the onion blossoms, the red chilly flakes and keep stir frying till the water start to dry up. Add lime juice to balance flavors, check and adjust seasoning at this time. It was so yummy I forgot to click a picture of my meal. I cook the same stir fry with spring onions or scallions as well, use chopped red onions if you don't have any of these greens. The taste will be as good, just the look of your plate will be a little dull, that can be taken care of by adding some other green on your plate. Isn't it? YUM!! 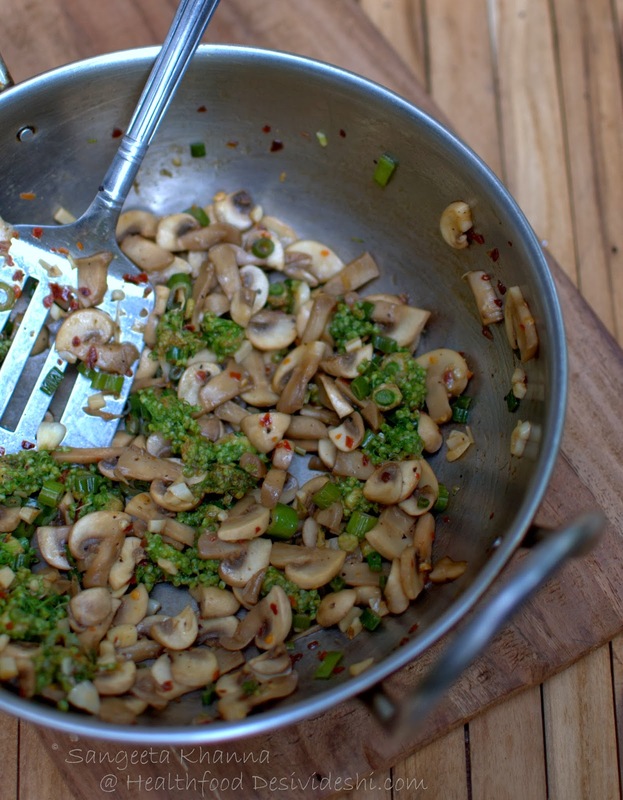 I love that first picture, and the idea of a simple stir fry with so much flavour ... immense possibilities! Mother Dairy has begun keeping onion scapes too! Got some day before! Do you get onion blossoms in Gujrat? 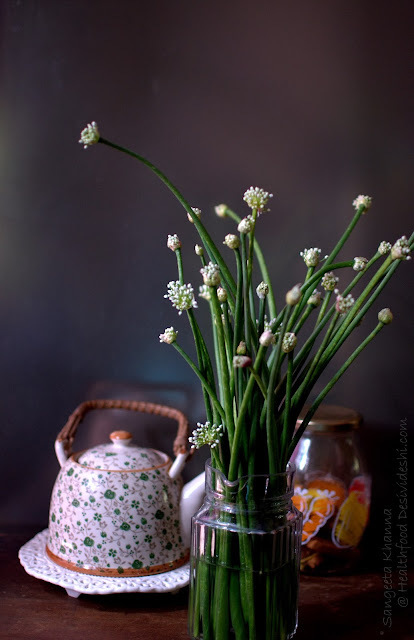 My mum uses the stems of onion blossoms and discards the flowers..now I know how to make use of them!!! 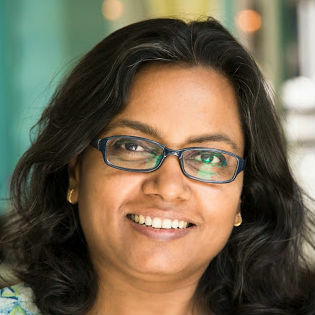 The blossoms are packed with flavors Sushmita. Get them asap as they will be out of season really soon. What are the blossoms known in Hindi? Pyaz kali or pyaz ke phool.